Item392 - Swan View 92. Plan of Swan View showing Lots bounded by York, Tunnel and Talbot Roads and the National Park. Mahogany Creek rail deviation shown [scale: 10 chains to an inch]. Item393 - Swan View 92/1. Plan of Swan View showing Lots 52-89 by W.J. Crowther between Stirling and Camfield Roads. [scale: 4 chains to an inch]. Item394 - Tammin 183. Plan of Tammin showing Lots 1-44 bounded by Ridley, Donnan, Booth and Strang Streets. Walston, Draper, Jameson and Britton Streets. Railway Station Yard shown. By G.M. May [scale: 3 chains to an inch]. Item395 - Toodyay West 11A. Plan of West Toodyay showing Avon River and surrounding Lots between North Street and Avon River and Wellington Street and the Avon River [scale: 6 chains to an inch, Tally No. 005859]. Item396 - Toodyay West 11B. Plan of West Toodyay showing Avon River and Lots facing the River and area vicinity of Avon Terrace, River Terrace, Pensioner Road, North & Charles Streets [scale: 6 chains to an inch, Tally No. 005860]. Item397 - Toodyay West 11C. Plan of West Toodyay showing 5 separate drawings. "A" by C. Evans 31/3/1913. "B" Sept. 1851. "C" by F.T. Gregory 18/11/1851. "D" by Governor Fitzgerald 24/7/1851. "E" by R. Auston 1/1838. Item398 - Toodyay West 11/1. Plan of West Toodyay showing Avon River, Lots facing River and vicinity [undated, scale: 6 chains to an inch, Tally No. 005862]. Item399 - Toodyay West 11/2. Plan of West Toodyay showing Suburban Lots between Leeder Street, Avon River and those Lots bounded by Avon Terrace, Lukin Street, SW Terrace and Avon Terrace [unsigned, scale: 6 chains to an inch]. Item400 - Toodyay (Newcastle) 12. 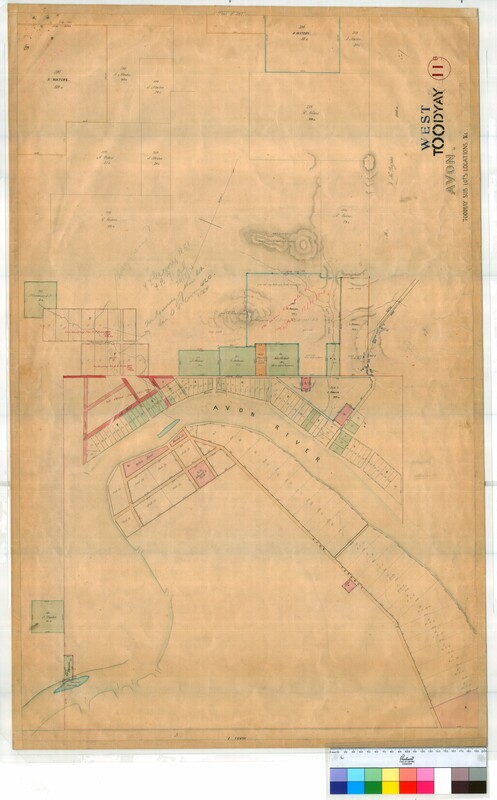 Plan of Toodyay Townsite by F.T. Gregory 1852, W. Phelps 1859/1860, by C. Evans 1861 and unsigned [scale: 4 chains to an inch, Tally No. 005855]. Item 396 - Toodyay West 11B. Plan of West Toodyay showing Avon River and Lots facing the River and area vicinity of Avon Terrace, River Terrace, Pensioner Road, North & Charles Streets [scale: 6 chains to an inch, Tally No. 005860]. Toodyay West 11B. Plan of West Toodyay showing Avon River and Lots facing the River and area vicinity of Avon Terrace, River Terrace, Pensioner Road, North & Charles Streets [scale: 6 chains to an inch, Tally No. 005860]. Confirm Item Request: Toodyay West 11B. Plan of West Toodyay showing Avon River and Lots facing the River and area vicinity of Avon Terrace, River Terrace, Pensioner Road, North & Charles Streets [scale: 6 chains to an inch, Tally No. 005860].